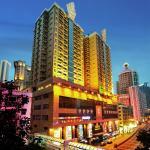 Hotel Fortuna is conveniently located in the popular Macau City area. Both business travelers and tourists can enjoy the hotel's facilities and services. Free Wi-Fi in all rooms, casino, 24-hour front desk, 24-hour room service, facilities for disabled guests are there for guest's enjoyment. Each guestroom is elegantly furnished and equipped with handy amenities. Take a break from a long day and make use of sauna, massage. For reliable service and professional staff, Hotel Fortuna caters to your needs.